Exclusively for eMarketer PRO clients, our Forecasts empower you to tell compelling stories with data, quickly and easily. We forecast thousands of data points on hundreds of digital topics. A few examples of the most popular forecasts: mobile ad spending by format, time spent with media, worldwide smartphone users. Why are eMarketer forecasts credible? 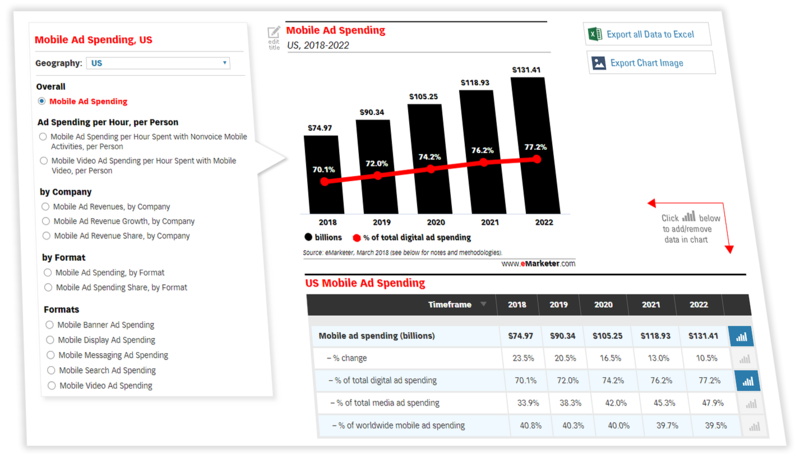 eMarketer’s forecasts are powerful because of our unbiased, multi-source methodology. We have access to and analyze data from the largest number of sources in the industry — over 3,000. A meta-analysis like this minimizes the restraints of each research methodology to the lowest degree. Each forecast metric is evaluated in conjunction with a variety of interconnected factors including macroeconomic trends, media consumption patterns by consumers of difference demographic and socioeconomic background, and earnings of major media outlets. This holistic perspective is the foundation for eMarketer’s forecasts and is why eMarketer is known as the industry standard for data on digital.